The Town of South Windsor, Connecticut (pop. 26,000) is dreaming big with GIS, thanks to its Esri enterprise license agreement. When residents of the New England town want to report a damaged stop sign, a dead animal on the road, or a missed trash pickup, they can use the town’s new iOS mobile app that Esri developed to alert the town’s staff to the problem. 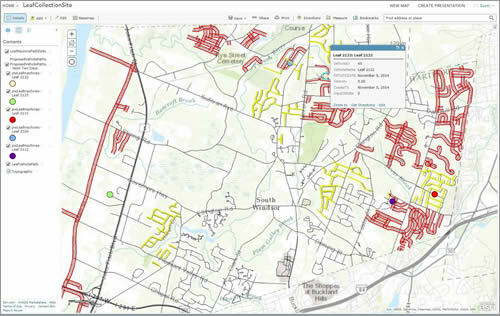 South Windsor also uses Esri’s ArcGIS Online to manage its leaf collection operations. Read the article. Staff in the Town of South Windsor monitor leaf collection progress in real time using ArcGIS Online. Want to share a map presentation and add it to your website or blog? You can use Share in ArcGIS Online, which gives you the HTML you need and lets you set options for the embedded presentation’s size and links to a larger view. Read the tip. Miele, Inc., which sells high-end appliances such as smart ovens and sleekly designed vacuum cleaners, finds niche markets using Esri Tapestry Segmentation data. Read the article. Sempra Global managers use online maps created with Esri ArcGIS to share information about assets such as wind turbines, liquefied natural gas terminals, and pipelines. Read the article. To make design options real, urban planners, architects, and designers need strong 3D visualization power. The Geodesign Summit will be the perfect place for them to see the latest 3D visualization tools and technologies. Read the article. 3D and web GIS take a giant leap forward with the new release of ArcGIS 10.3. Sud Menon, Esri director of software development and engineering, tells the story. Watch the video. Explore a new global ecosystems map made up of 4,000 ecological land units, including landforms, bioclimate, rock types, and land cover. Tour the ecosystems using this Esri Story Map Journal. Be among the first to become proficient with ArcGIS Pro by taking Introduction to ArcGIS Pro for GIS Professionals, a new Esri course. Register today. Esri's Joseph Kerski recently integrated GIS into a computer science course. He urges other GIS professionals to build bridges with the computer science community. Add custom widgets to Web AppBuilder for ArcGIS and personalize it with custom themes. The Esri Developer Summit will host plenty of tech sessions on working with Web AppBuilder for ArcGIS. Read the blog. Configure your web apps from scratch faster and more easily than ever with the new Web AppBuilder for ArcGIS. Esri’s Ismael Chivite shows you how. Watch the video. ArcGIS 10.3 includes a new stream service that lets you stream real-time data onto a web map. Watch the video. Esri’s Kenneth Field used ArcGIS Pro to create a 3D web scene of airline flight data from openflights.org. He calls it Airflow Globe. Read the blog. The wait is over! You can now download the Android version of Explorer for ArcGIS free from Google Play. Start exploring maps today. US federal government customers can buy Data Appliance for ArcGIS through Esri’s General Services Administration schedule. Order today. Indulge in geospatial technology at the ultimate geogeek event, the Esri User Conference. Stretch your mind during moderated sessions and revitalize yourself at the Map Gallery. Book a spot in San Diego. Is your Story Map stunning? 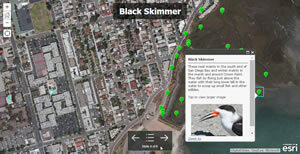 Esri seeks superb examples of Story Map apps for the Story Maps gallery. Fill out a short form, and if selected, your app will appear within 10 days. Read the blog and submit your app.